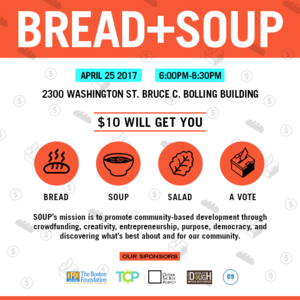 Will get you into the event, bread, soup, salad, and a vote! SOUP's mission is to promote community-based development through crowdfunding, creativity, entrepreneurship, purpose, democracy, and discovering what's best about and for our community. This event does not have any rewards. If you are a business owner that would like to provide a reward for this event contact us. BREAD focuses on the belief that Boston’s communities of color are sufficient and capable of becoming prosperous by investing value in ourselves, while serving others. We believe it is possible to express our strengths and to share these strengths in a mutually beneficial way to help each of us prosper and grow, but only if we create space to collectively nurture our human connections. Why do you want to decline this event? Do you have any constructive feedback for the creator of this event?